Is there any tool which has facilities to create screencasts and edit videos? The answer is YES. Today, I’ll recommend you 7 best video editing and screencasting tools as well as their pros and cons. Note: You may wonder why powerful video editing tools like Adobe Premiere and Nero Video don’t appear on this list. It’s because this article aims at listing the tools specifically designed to record screen, not merely edit videos. 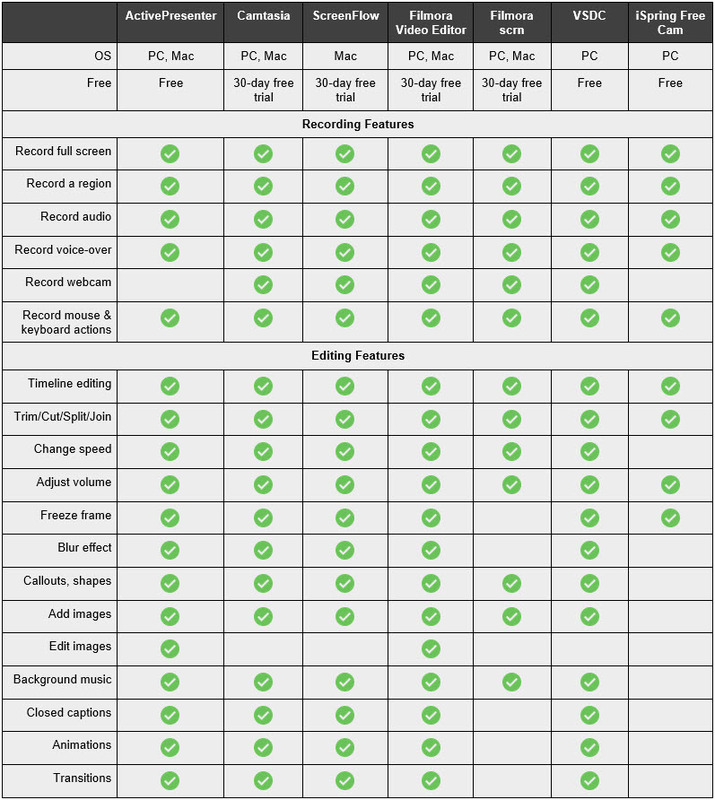 The following table is a basic checklist that we use to pick up the best apps offering both these features. Keep in mind that items will vary in customization abilities, and may depend on the purposes of software developers. In fact, more powerful tools will have other items that aren’t even on this list. Now it’s time to learn more about each of these all-in-one screencasting & video editing tools. Developed by Atomi Systems, ActivePresenter is the app I recommend for both expert and novice users. The app is currently available to Windows and Mac users with three editions: Free, Standard, and Professional. Additionally, the next version of ActivePresenter is expected to arrive at the end of this year. In this version, the app will provide more advanced features like webcam recording, audio noise reduction, and green screen effect. 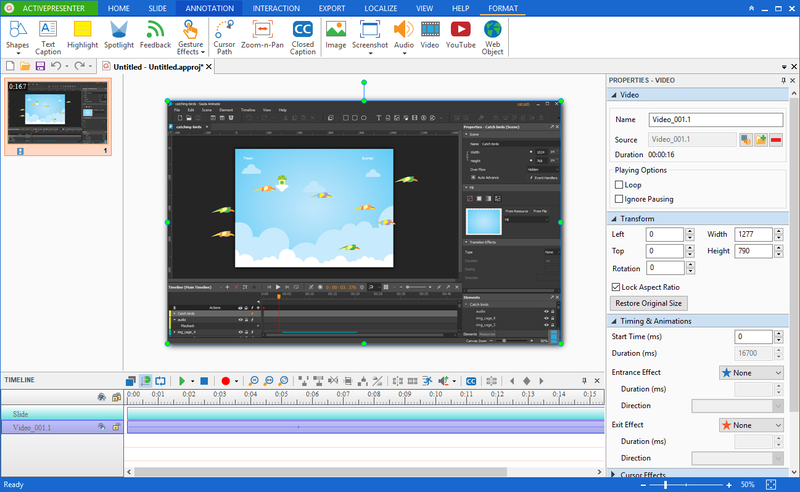 In a word, ActivePresenter is meant for recording screen and editing videos. But unlike Camtasia or ScreenFlow, it’s much more user-friendly because of a familiar-PowerPoint interface. So, even you are a beginner in the field of video production, you won’t take time to get to know the app. Above all, the app lets you use almost all recording and editing features without charging a penny. Obviously, if you go with the Standard or Professional version, you have a chance to experience more amazing features. In case you still don’t know how to use ActivePresenter for recording screen and editing recorded videos, give the Tutorial page a read. Offer a free edition without any time limit, watermark, and pop-up ads. This best suits users who want to create videos for non-commercial purposes. Advanced recording features: Full Motion Recording and Smart Capture. Support the Lock to Application and automatic smart annotation feature in the recording. The Lock to Application featue allows you to select the running application window to snap into the capture area. Offer the multi-track timeline for image, text, video, and audio. Insert a lot of effects: animation, transition, blur effect, picture-in-picture. Provide multiple annotations such as zoom-n-pan, closed caption, and cursor path. Export video to many formats: MP4, FLV, AVI, WMV, WebM, and MKV. Can’t share directly to video sharing platforms like YouTube. You need to upload exported videos manually. 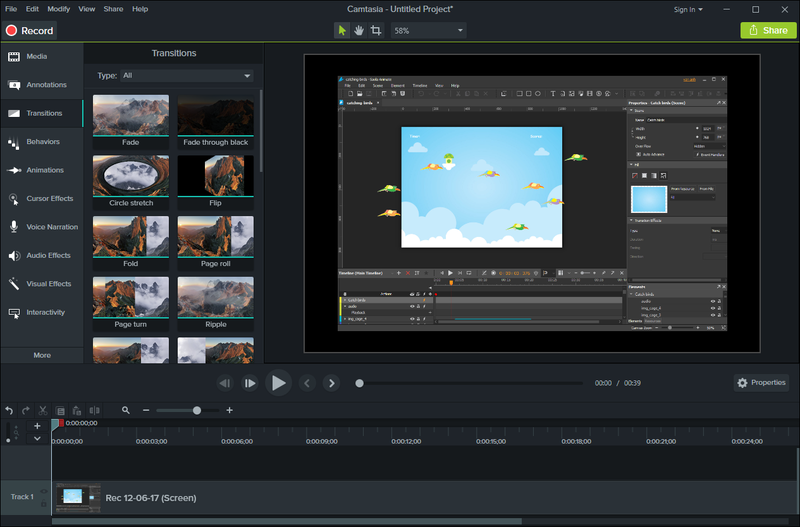 Camtasia is a professional video editor produced by Techsmith. Formerly known as Camtasia Studio, the app has a long development history for PC. It has been also available to Mac users since 2016. The latest versions of Camtasia are 9.1.1 (Windows) and 3.1.2 (Mac). Camtasia has reached over 14 million downloads, and this helps explain its popularity. In a word, it is a very powerful tool with many screencasting and video editing features. Note that when downloading and installing the Camtasia installation package, you’ve got two apps set up on your computer. The first is Camtasia Recorder for recording screen. The second is Camtasia for editing videos. However, you can still open the Camtasia Recorder utility right inside Camtasia with one mouse click. Offer the Lock to Application feature. Draw on screen while and after recording. Add text/images/videos/audio clips, animations, highlights, keystrokes, shapes, and so on. Offer royalty-free tracks or import your own. Output video formats: AVI, MP4, MPG, MPEG, WMV, MOV, SWF. Mind that SWF is only for files created from Jing or previous versions of Camtasia. The free trial version includes watermarks in exported videos. The installer file is quite large. So, make sure that your PC meets the minimum system requirements. The user interface looks modern but a little bit busy. You probably feel overwhelmed when using the app the first time. ScreenFlow is a dedicated tool for all-in-one recording screen and editing video on macOS. Despite coming into market just on June 2016, ScreenFlow has attracted a significant number of loyal users. This app offers a range of features which you might get excited. ScreenFlow consists of some noticeable features in comparison with other tools in this list. It provides better audio and video filter along with clear voice recording. In the latest version, ScreenFlow 7 also gives you the capabilities: 60 fps Timeline, play clips in reverse, and OLED touch bar. However, you have to pay a high amount to access some of these advanced features. Add transitions, animations, green screen effect, images, closed captions, etc. Output video formats: MP4, MOV, M4V. Export videos directly to Vimeo, YouTube, and Facebook. Exported videos are labelled with watermarks. 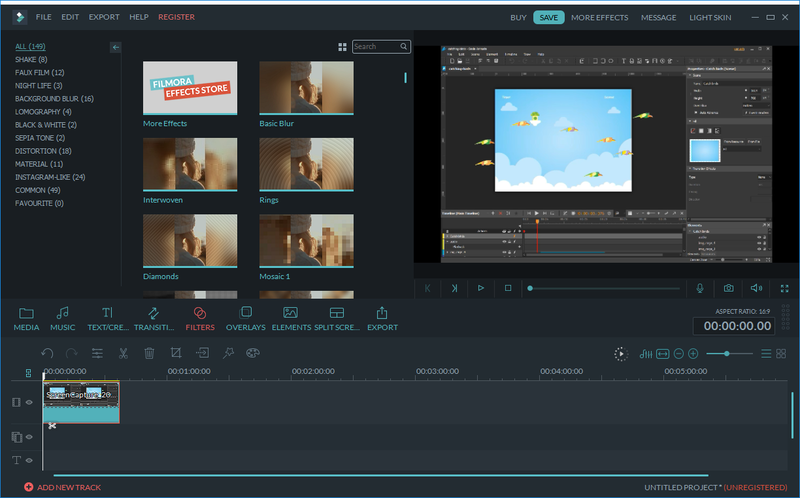 Basically, Wondershare Filmora video editor is the upgraded version from Wondershare video editor 5.1.1. This is a popular and well-rated video editing tool with over 50 millions of users. Filmora impresses users with a pleasing user interface, plus a collection of transitions and modern video effects. The video editing features of Filmora deserve a try. But in terms of recording a screen, it comes as no surprise. The app itself recommends you to install another software called Filmora scrn to have a full experience. I will discuss this tool in the following part. Offer the Target Window feature. This feature works the same as the Lock to Application option in ActivePresenter. Advanced video editing features: 4K editing, noise removal, reverse, color tuning, audio mixer, and so on. Import clips or photos from Facebook. Support video output formats: WMV, MP4, AVI, FLV, MKV, MOV, WebM, TS, 3GP, MPEG-2, HTML5. Label watermarks in output videos. Offer only some effects in the free trial version. To use all available effects, you need to upgrade to the paid version, or buy effect sets you want. Filmora scrn is a product of Wondershare as well. Because of specializing in recording screen, Filmora scrn is more flexible than Filmora video editor in certain aspects. Especially, you are free to record from your screen and webcam at the same time. This facility comes in handy when you wish to record game, create instructional videos, or deliver presentations. While Filmora scrn is certainly suitable for beginners, professional users may not feel satisfied. Probably because a lot of advanced features are absent in this tool. In this case, it’s better to take a look at other tools like Camtasia and ActivePresenter. Add annotations like callouts, arrows, lines, and so on. Supported output formats: MP4, MOV, GIF. Require a 64-bit operating system to install. Lack advanced video editing and screencasting features. Include watermarks in the exported videos. 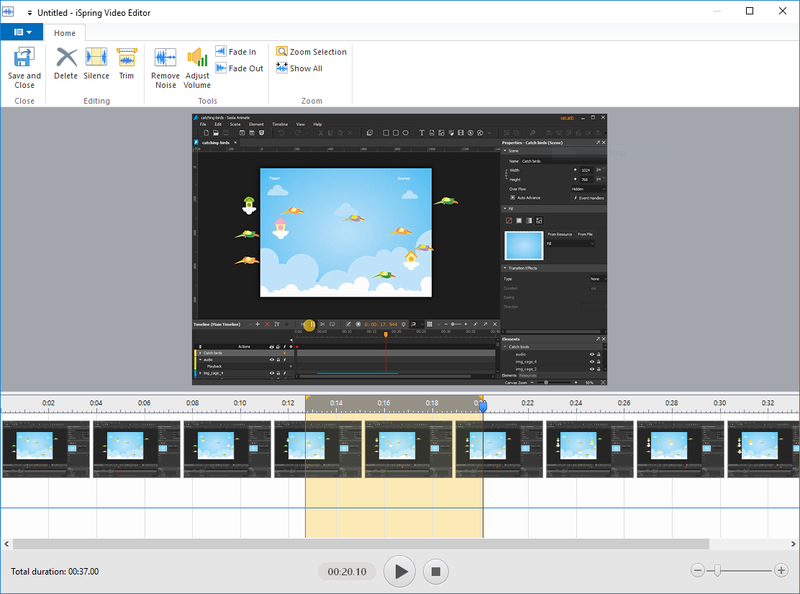 VSDC Video Editor is also one of the best free video editors in the market. You possibly download and use this app completely free without any restriction. 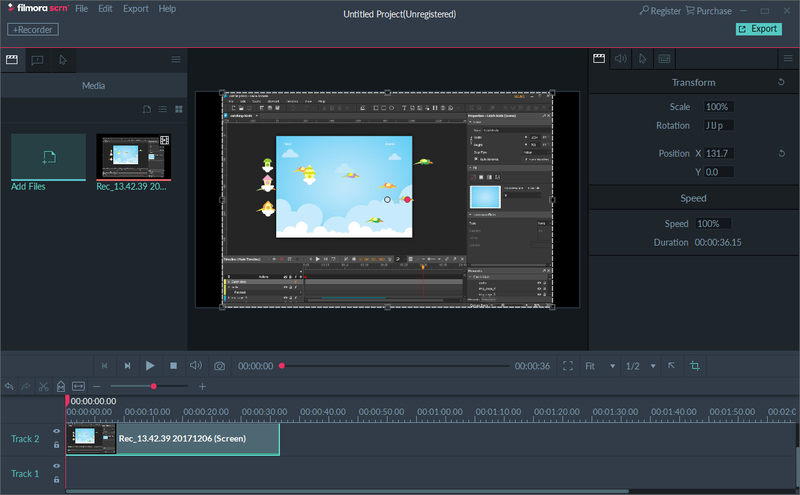 However, the paid version has more enhanced video editing features such as masking tool, and audio waveform. 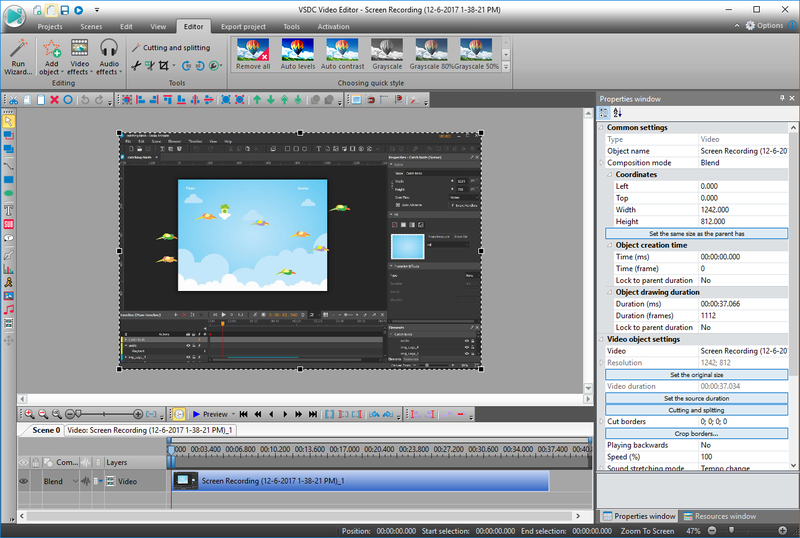 Although it’s easy to use, VSDC Video Editor has some drawbacks. For example, the user interface is a bit awkward. In addition, you can’t preview the video directly on the Canvas but a pop-up video player. Consequently, it’s unfeasible to preview and edit videos simultaneously with this app as easily as you do with others. With this in mind, workflow may be more complex, costing more time and effort. Offer a free solution without trial period, watermark, and ads. 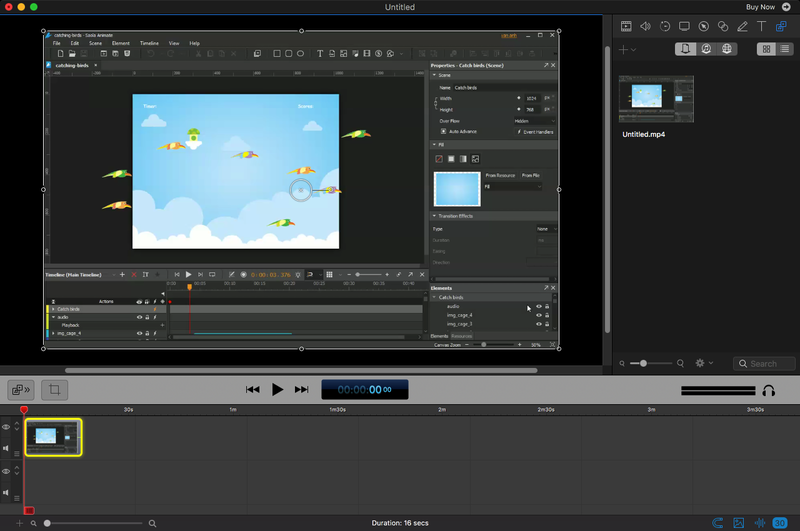 Have a wider selection of video editing features: audio effects, blending modes, 3D charts, and so on. Support a large number of input formats, including videos and images. Export video to formats: AVI, MPG, MOV, WMV, MKV, RM, SWF, FLV. Upload video to YouTube right inside the app. Advanced features are available in the pro solution only. The user interface looks dated. So, expert users may feel annoyed. iSpring Free Cam is a free screencasting tool for Windows only. The app has an intuitive user interface, making it easy for you to work with. Besides, basic recording screen facilities come in handy. The options to share videos on social media are also available. However, the video editing timeline is poor. That is, you don’t have much control over it, and it’s impossible to insert annotations into videos. iSpring Free Cam is a good option to create videos for commercial, educational or non-profit purposes. But in this case, the app asks you to fill in a form for getting a free product license. Use for free without watermark and time limit. Exported video formats: WMV (HD quality). Share videos instantly on YouTube. Not available for Mac users. That’s all! I hope you find this article useful. As always, let us know your thoughts on these apps, and which tool you consider as the best option. If you love ActivePresenter, download and get started working with the app right now. Also, don’t forget our blog, tutorial articles, video tutorial series, and online community. They surely help you a lot along the way.